Good Saturday, everyone. We continue to track a few bands of light snow and flurries out there today, but the star of our weather movie continues to be the bitter cold. Our temps may hit zero or below in the comin days, just as we kick off the brand new year. Those continue into the final morning of 2017, with actual lows in the single digits. The day will also feature a small band of light snow and flurries zipping through some areas. Highs may not get out of the teens for many areas, with wind chills near zero all day. That sets the stage for a bitterly cold start to the New Year. Temps will be in the single digits to start, with teens for highs. Winds making it feel much colder. Monday night into Tuesday morning will find temps dropping into the danger zone. Readings from 0 to 5 above will be noted in the south, with the northern parts of the state in the 0 to -7 range. Wind chill readings of -5 to -15 will be noted. This is brutal stuff. In terms of any snow chances for the week ahead, we will have to watch for hard to time, and hard to find, disturbances diving in from the northwest. I suspect a system or two similar to the one that just grazed us, will try to show up. With even colder air in place, the setup should send those farther south. I will have updates later today. Have a good one and take care. Not to say anything but moved away from Kentucky so my kids could enjoy snow here in Pennsylvania got 5 inches of snow with another inch or so coming before it ends. I enjoy my true winter’s. That will probably never happen in Kentucky the snow hole capital of the world. The closest to a super snow was the 93 blizzard. I was a kid and that has been the worst storm by far in my lifetime living here on KY. A few others are the 94 snow/ice storm in Jan, the 96 blizzard and, to a lesser degree, the 2015 Feb storm. I’m going to be realistic and say that this current weather pattern is nothing unusual. It has happen many times before in the past. We will just have to take what Mother Nature throws at us. 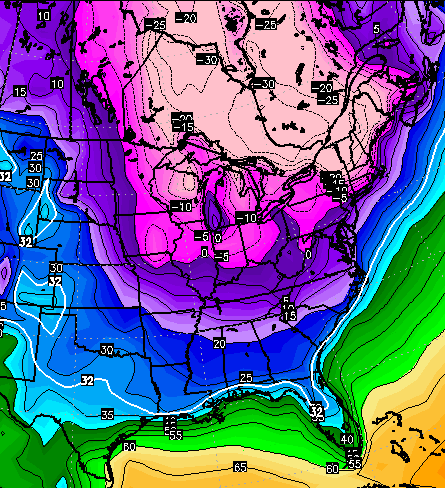 The frigid Arctic air is miserable, but it will past that’s a given. As far as any ‘ Big time snow events ‘ using logic instead of weather models, I would say no. I’m a coffee-cup-half-full kinda gal and while I would love some snow, let’s look on the bright side… The long hours in front of the wood stove are heavenly! There will be fewer bugs next year thanks to the frozen tundra outside. And the Cats ate the Cardinals yesterday. Cheer up, fellas! Enjoy the football today, build a fire, chop some wood, make a stew and have faith that snow will come again someday. Good news is, we were told it would most likely be a frontloaded winter….the front is about over…come on spring temps!!!!! Apologize to the snow lovers, maybe next year. 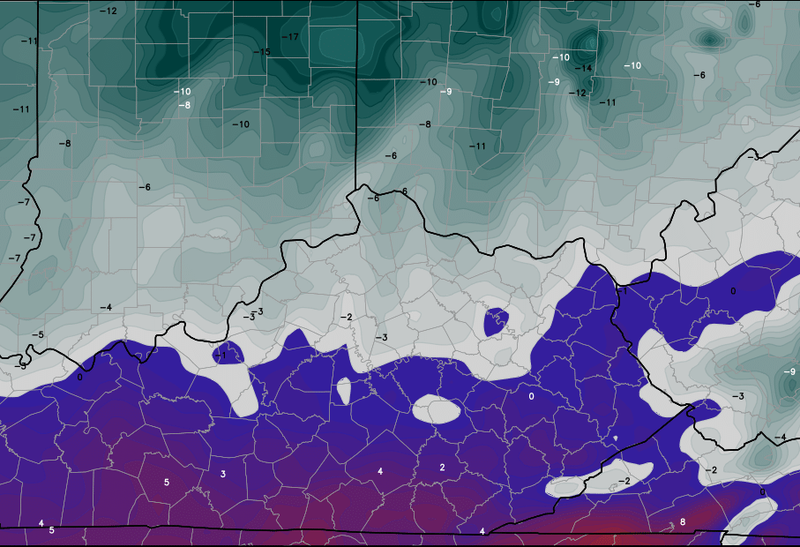 At least you have been getting flurries and snow showers up your way…nothing here in southern KY, absolutely nothing! You will get snow in Southern Ky before winter is over. My brother lived in Paintsville 15 years and they had several nice big snows when he was there. Big floods to. I live about 100 miles or south of there but I luck up with the southern systems (sometimes) when they go up the east side of the apps. Occasionally , I get snow from those southern systems when almost the entire states gets nothing! We received around 1 1/2 to 2 inches last night where I live in Jackson County Ohio. It’s snowing lightly now. This is the third clipper that has brought us snow the season. It’s 24 degrees and going to get colder. Thanks Chris. For us to be in the part of KY that is not likely to see any flakes, my sky sure does look snowy. Maybe we will see some of those festive flakes before its all said and done. Too cold for snow. Only in Kentucky. We are truly limited when it comes to snow chances and have went through December without any true threat for snow. Not looking good for the near future and by mid-February it really takes a perfect situation to get snow because the average highs get in the 50s in the southern half of he state. There’s a few flakes flying in Versailles this morning! It’s pitiful when you get so excited over a few flakes but I am. It doesn’t seem right for it to be so cold without a little snow. I hope chances ramp up in the coming weeks! Winter has just begun and will be with us until the end of Feb. and we will have our chances of snow, especially when we come out of this cold spell. Get out and enjoy it people and quit complaining, There is nothing you can do about it. Clippers will continue to streak down from Alberta and give us shots of snow. Might be just festive in nature, but I will take that over Sunny and cold. The Climate Prediction Center places much of the West streaking into our region with above normal precipitation chances coinciding with below normal temperature chances for the Jan 6-12 time frame. A system or systems with Pacific moisture and a Gulf of Mexico back from vacation? Teleconnection signals though not perfectly aligned are lending some support too. Could be our first significant winter event of the season. By the way, I’m not using models, just forecast techniques and signals.